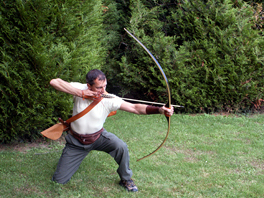 The modern gesture with sight has differentiated from natural gestures (instinctive or primitive) since the invention of epoxy glue and its fiberglass to create "against nature," recurve bow" which spawned an upper lengthens, but causing an oversized gestures. 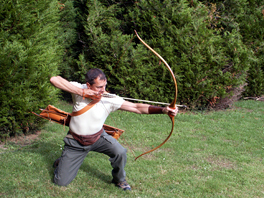 (50-60 years, when these "neo-shooters" have broken most of the olds bows of solid wood, with their new gesture against Nature). 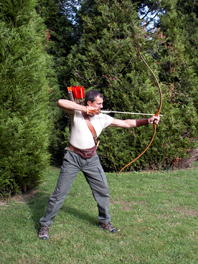 The shooters then opted for a standing position, outstretched legs straight (which tends to dig the lumbar), the bow arm stretched to the limit with high shoulders, open and loose hands in the riser of bow, filled lungs, allowing an extension as large as possible, while still having the string/rope in front of the eyes, to half of body measurements. But also keeping one eye open for the placing under a sight hole, which seeks the center of the target, but handles even the arrow, which has become as tiny as a knitting needle aluminum or carbon. This neo-technique, certainly more accurate in the result in points on the long distances, is nevertheless difficult to learn and only a few individuals succeed in the high rankings. To be honest with you, and no offense to those (tens of millions of followers believing that modernization easier) who condemn themselves to shoot a flat terrain, perpendicular to the target with its center at the shoulders and not being hardly open an bow exceeding 40 # pounds, but its heavy weight equipped with its stabilizers, I simply tell them that all their body ills (elbow, shoulder, neck, neck, back pain, etc.) and psychological problems (nerve disorders, concentrations, etc.) caused by this forced and binding gestures could be alleviated/saved by practicing natural and invigorating body gesture: that of instinctive shooting, original / universal. The instinctive shooting that is from the original shot (primitiv/universal) and while having improved some technical details (arrows notches, window riser, standardized material) allows anyone to easily access without physical restraint, with learning only a few hours thanks to its naturally mere gestures, logic and physiologically balanced. 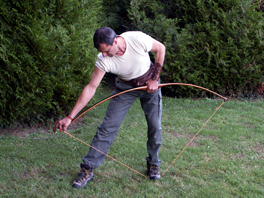 In contrast to the modern shooting equipment (for the purists) remains as the most simple and natural (simple wooden bow, wooden arrows, quiver original/primitive hunting etc.). Learning combines breathing techniques (expires), simple positionings very soft which are fully comparable to the hatha yoga practices (pranayama, breath), martial arts (aikido etc., positioning). 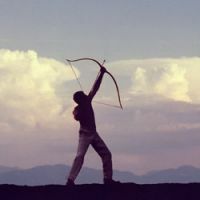 The practice of shooting with the bow Nature, brings us a better physical and mental balance (refocus) and a controlled energy more accessible. Similar to the original gestural primitiv/universal of bow hunting, the art while remaining a game, gives us some sublimation. One can also develop it, according to his personal ambitions, the concrete notion of zen practiced throughout the Tao of Chinese or Japanese Shinto arts. (Kyudo), but a little lost or obscured in Western Europe. Instinctive shooting can be practiced in his garden (subject to security), 6 to 50m. The material is reduced to its simplest expression: simple, lightweight bow, wooden arrows and natural feathers, simple quiver. "Learn with an experienced trainer, will save you unnecessary wandering life you will never know how to explain your endless mistakes. " From experience, lessons are given preferably in private individual, because they are more efficient than group sessions. A test of eye sight will be conducted at the entrance. - First lesson two hours outdoors on flat ground: Theory and Practice. - Second lesson two-hours on flat ground: technical and practical. - Third lesson of two and a half hours in the forest: technical and practical in nature. - Advanced Techniques and practices, advanced gestural methods. - Advanced hunting techniques and practices. 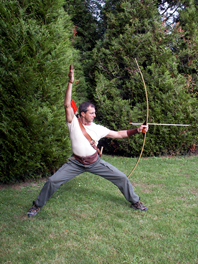 - War Shooting Methods (Middle Ages). 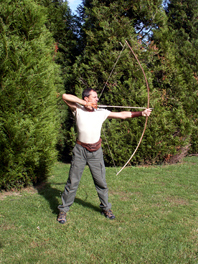 - Ethnic and prehistoric firing methods. - Physical and mental methods (investment energy, breaths). Tests and loan including various equipment. Classes are taught in and outside appointment in good weather if possible.